Riu Cancun hotel is a large waterfront resort. Outdoor dining is a favorite activity at the all-inclusive Riu resorts. Pool time is another favorite activity at the Riu resorts, which have large pools. We like the laid back European style of the Riu Resorts brand, and the four Riu all-inclusives located in Cancun work hard so that family vacationers enjoy their beaches, outdoor activities, and endless supply of really good food. Four resorts? 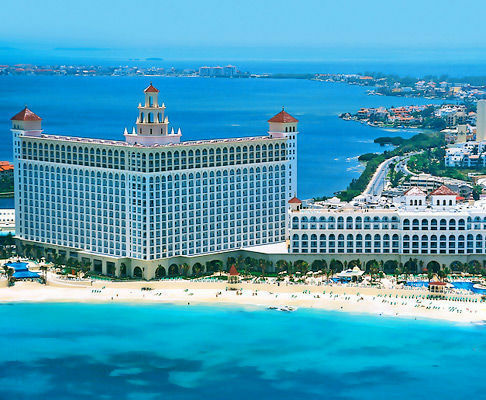 The three current Riu Resorts in Cancun were joined by a new one in May 2012 when the Spanish resort company unveiled the even more upscale, 562-room Riu Palace Peninsula next to the Riu Cancun, Riu Caribe and Riu Palace Las Americas as part of the resort’s 40th anniversary makeover. If budget is not your guide, this makes your most difficult decision — choosing which one to book — even harder. The Riu Resorts in Cancun offer some of the city’s best stays. All three Riu establishments make it easy for families with younger kids to travel. They each have connecting rooms for larger families (many with living rooms and sofa beds), children’s pools and playgrounds, and babysitting services. A children’s day program for kids 4 to 12 is also available at each resort. Best of all, all four of the Riu Hotels are all inclusive. What does that mean? Complimentary meals, unlimited snacks and drinks, an open mini-bar in your room, and access to all of the activities at the hotel you are staying at. What Riu typically does is put their highest cost resort right on the beach, then builds the others inland from there, dropping the price and just a few luxury touches the farther you get from the water. Since most facilities are shared among guests, that makes it very affordable for a family to sleep away from the beach in a top value property, but be able to use the beach and oceanfront pools at adjoining resorts. The Riu Palace Peninsula is the newest and most posh of all the resorts. Rooms have big balconies, king beds and large flat panel TVs; modern bathrooms have separate shower stalls, jacuzzi tubs, and fine toiletries. 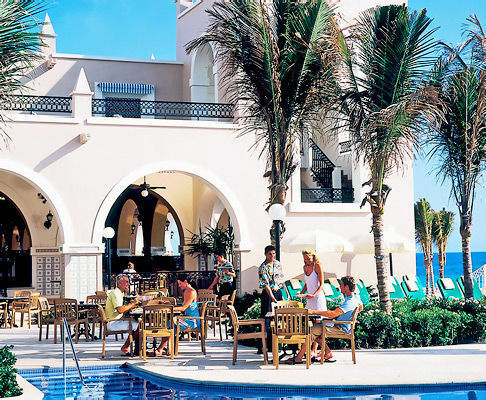 This Riu complex more than a dozen specialty restaurants and bars serving premium liquor. Note that families who book any of the resorts have access to most facilities at the others, but there may be exceptions at this one. Additionally, there is a heated outdoor pool for winter and a second lounge pool with hot tubs and a bar. This resort, adjacent to the Riu Caribe, also has the brand’s Renova Spa. If you’re staying at the highest priced resort, Hotel Riu Palace Las Americas, you’ve got your choice of the hotel’s 372 rooms — all suites. Each includes a living room with a pullout sofa, and many rooms have a balcony and ocean view. Hotel activities include tennis, beach sports, a fitness center, wind surfing, snorkeling, canoeing, Pacha disco, daily activities designed especially for kids, and five restaurants. A stay at the Hotel Riu Caribe includes a choice of 506 guest rooms with a balcony or terrace and ocean views. All were totally refreshed in a June 2012 makeover. Junior suites with living rooms are also available. Here, the hotel activities feature tennis, a fitness center, beach sports, airgun shooting, aerobics, scuba lessons, windsurfing, bodyboarding, canoeing, snorkeling, daily kids activities, nearby golf, and three restaurants, which were redone recently along with the pools and resort’s evening entertainment theatre.. The biggest Riu facility on Cancun, the Hotel Riu Cancun has 569 guest rooms, each with a balcony or terrace and at present, the cheapest rates. Many rooms have ocean views. Again, junior suites sleeping up to five with a guaranteed ocean view are available. And if you’re staying at the Riu Cancun, be sure to make room for some of the hotel’s activities in your schedule, including tennis, a fitness center, beach sports, scuba lessons, windsurfing, canoeing, snorkeling, daily kids activities, nearby golf, free admission to the Pacha disco at Riu Palace Las Americas, and four restaurants. If you like your Cancun stay, there are plenty more Riu hotels to try, each with its own touches of wrought iron, Spanish tile work and traditional decorative fountains. 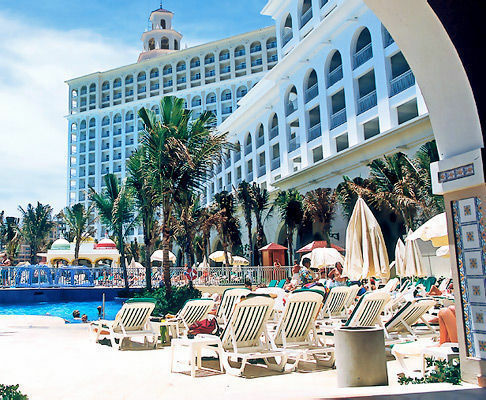 There are 16 all-inclusive Riu resorts in Mexico: in Cancun, the east coast of the Yucatan Peninsula, Playa del Carmen and on the west coast near Puerto Vallarta. In general, the top value season for families remains the late autumn — ideal for those with preschoolers.